The first event was organized in 1998. I had dreamed up four ideas for the launching of VIDA purified water, as part of my plans to grow the Big H brand from a regional business and place it on a national stage….with focus on promoting the natural, healthy beverage products that we had in mind to extend our product and market range. My brother Big-h Juices liked this idea more, so we went with it. We wanted a grueling adventure event that would showcase the natural beauty of Belize and our healthy products…with potential for attracting international interest. The first persons I went to was John and Martha August….owners of Marthas Kitchen. John is the son of Peter August, one of my dads best friends and compadre, both involved in the organization of very big horse racing events in San Ignacio in their time. Martha is my cousin….and their restaurant and guest house was the bee hive for tourists in downtown San Ignacio, where river canoeing tours had already sprouted. They loved the idea instantly….and promised to help in whatever way they can. They then introduced me to David Simpson…who had started a small DAVIDS river canoing and caving tour operation….and Dave introduced me to Tony’s, who was also doing some canoe rentals and tours. These guys had grown up on the river and had a lot of knowledge of the Cayo district river….but we needed organizational and leadership skills as well. At the time, my best friend was Alejandro Habet….who managed Pepsi Cola Belize…and he at once agreed to assist with seed money of $3,500….with the agreement that only Pepsi and Carib beer products would be sold (Pepsi was agent for Carib beer in Belize at the time), along with Big H products, at the various points along the race. We decided to go meet with Rene Villanueva Sr and Jr to draft them into our plans, as a major event needs a powerful media machine….and we chose their annual Love FM Valentines party at BTL park. Their eyes almost popped out of their heads….and they instantly agreed to come on board…and for the power of Love FM to be used to promote and broadcast the event. This was very instrumental in the building of this event. John August then took me to meet Peter Pacz…an ex-British soldier that had married a Cayo-gial and returned to Belize and started a guest house and PACZ TOUR operation in San Ignacio. He agreed to help, and he took me to meet Mike Green, an American ex-pat who worked for the San Ignacio Hotel at the time. Mariam Roberson of San Ignacio Hotel agreed immediately to help, and to support Mike Green’s activities in our committee…and to attract other tourism interest in the event. Both these men were very instrumental in putting together the rules, safety and logistics for the event. Along with them, we coordinated with Michael Waight from Snooty Fox, Tony, Preck Preck, Pim, Clifford Sabala and David Simpson…to do a trial run of the entire course to see if it was physically possible and measure distances with GPS…and to scout the course for obstacles, dangers, etc. I went by road scouting for spots along the river that provided the best places for stops along the way…of the options, I decided on working with John Carr at Banana Bank, Mr Russel at Bermudian Landing, Ms Judith Fuller at Burrel Boom and to end the race at Belize Swing Bridge, with a big closing party at Baron Bliss grave site by the Lighthouse. We sent follow up teams to clear the course of debris and to place red flags in areas we considered dangerous and where participants would need to exercise extra caution. Luis Garcia, who had organized a canoe race the year before from Succotz to San Ignacio, also came on board with his local radio station. After attending a meeting of BTIA Cayo at Windy Hills….and hearing of their interest in enhancing the “tourism experience” by way of events-based activities…..I created the concept upon which the event would be hosted….a community participatory event based on three pillars (1) ecology and environmental awareness (2) culture and history of the Belize Old River (3) tourism development. This would make the event “more than just a race”, bringing a wider range of interests to the table…which would allow it to survive long into the future, unlike the cycling events that focused more on racing and were in decline. This event would revive the Baron Bliss holiday that had almost disappeared…at the time it was simply another day off from work, with no organized community activities….similar to how Labor Day and PanAmerican Day still are. All this while, I was approaching private business owners to sponsor the event…by way of providing station prizes along the race route in return for promotion of their business on Love FM advertising….and enlisting donors/service providers to help with key aspects of execution…Marthas Kitchen provided the breakfasts…Running W the lunches…and the camp site hosts would organize the dinners along with their local providers. The British Army and BDF agreed to support with referees and logistics support….the Belize Scouts with clean up….the Belize Red Cross with first-aid…Jeff, an American, came every year for the race, to help with first aid and safety. Many small business contributed $100 to $300 for specific station prizes. We charged a $200 registration fee from the teams to help defray expenses. I wanted the event to depend more on a wide range of small Belizean private non-political interests…than a narrow set of big donors and politically-connected government contributions. That is what had killed many community events in the past…not in the least of which was the Baron Bliss Day harbor regatta, which had grown to depend on a single $50,000 per year subvention from government. 31 teams of three persons each participated in the first event. 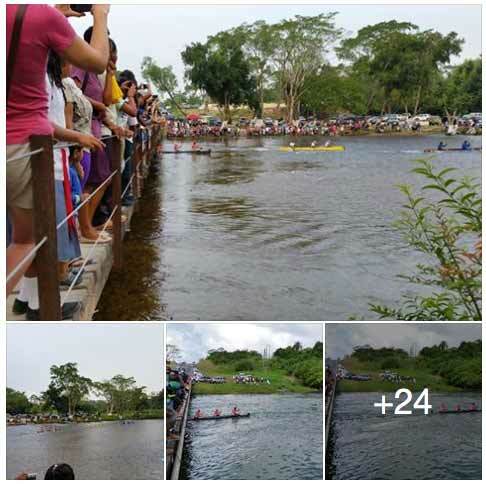 After listening to the exciting promotion and broadcast on Love FM, thousands came to the riverbanks to enjoy the race along the entire route. Glenn Godfrey got so excited by the time the event reached Burrel Boom, that he called me to offer a $1,500 station prize on behalf of his Belize Offshore, for the starting sprint on the third day, from Judith Fullers place to the Boom Bridge, where Glenn’s riverside property is located. Thus started the bigger private sponsorship contributions from all over. By the time we were racing from Manatee Lookout to Haulover Creek Bridge, I got a call from Mike Usher, who wanted to put a $500 station prize in honor of his dad at the location on the riverfront where their family was raised. Entire families came out with their grills and ice boxes to enjoy the riverside and the event…kids would climb the trees to the highest limbs that swayed in the wind, to be on their “reserved seat” to watch and cheer the racers…even the howler monkeys joined in the cheers….many villagers organized cultural events and prepared local cuisine for sale…at one point, a young participant cramped up and his team mates left him in the river….he strayed and got lost in the swamp and bamboo…scores of villagers volunteered to search day and night for him…luckily he was found a couple days later dehydrated, injured and hungry….but safe. What a weight off our shoulders that was. We partied in the night by fireplaces….slept under canoes….and woke with pain and fever from exhaustion…but we kept pushing on….with the help of many scores of people who appeared from nowhere to assist in any way they can. Even some of the spa’s sent their staff to give free massage to participants and organizers. Jeff the Medic helped bandage participants hands and butts…which in many cases was literally raw meat….since we started with old flat bottom canoes, Big H -juice crates for seats and minimum canoeing gear. All who worked at Big H gave freely of their time and effort in helping to organize and execute the event. The community spirit of Belize was awaken. The entrance to Belize City was a most welcoming one….the BelCan, BelChina and Swing Bridge were overflowing with spectators….people filled every spot where they could reach the riversides…..every veranda on riverfront homes were crowed with cheering families….all generations were smiling for the same reason. 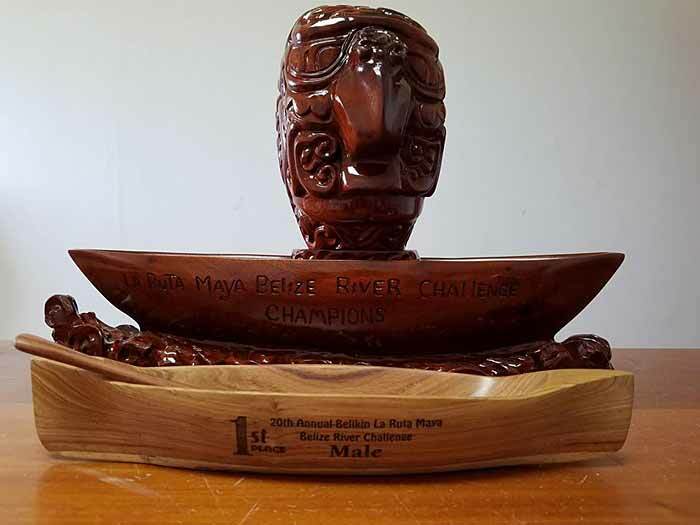 The Hobb brothers from Bullet Tree crossed the finish line under the Belize City Swing Bridge first and took home the Kinich Ahau (Maya Sun God carved out of exotic wood and donated by Benquenia, Martha Lara Lucero who worked for New Hope Furniture at the time) Trophy and thousands of dollars and other gift prizes. Organizers, participants, sponsors and spectators and supporters had a big celebration at the kiddies park at the foot of the Baron Bliss Memorial and Lighthouse. The Baron must have smiled and puffed on his cigar. It took us about a month from concept to execution….all those close to the event had come to know and appreciate “organizational power”……building with an efficient and effective institutional framework, with the various defined functions delegated to specific entities. A few days after the event…Mrs Beth Roberson dropped into the Big H office and gave me a plaque she hand-carved out of mahogany, with two iguanas, my name and La Ruta Maya Belize River Challenge engraved on it. And so….the La Ruta Maya Belize River Challenge was started. This article was written by Richard Harrison. Belize’s annual La Ruta Maya River challenge is one of the longest, most gruelling canoe races in the world. It is also a way to raise awareness about the beautiful river system that was once the “superhighway” of the ancient Maya. The La Ruta River Challenge was the brainchild of Belizean entrepreneur Richard Harrison, who started the race in 1998 in part to promote a line of purified water, sport and soft drinks and partly to raise awareness of the importance of Belize’s network of rivers and the need for conservation. 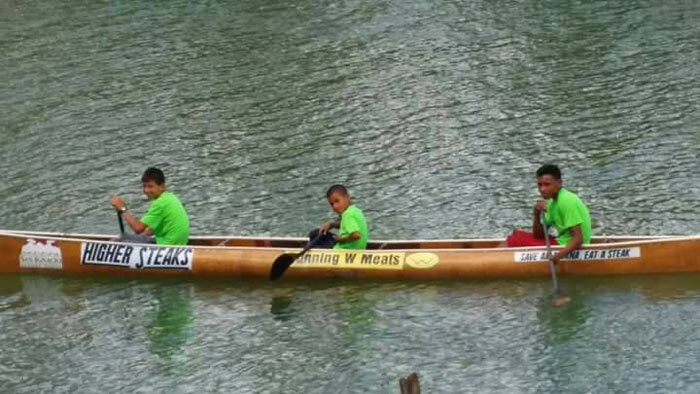 Starting in San Ignacio Town, downriver on the Macal River from Chaa Creek, three person teams paddle 175 miles to the finish line in Belize City, overnighting in the riverside villages of Banana Bank, Double Head Cabbage and Burrell Boom before the final sprint to Belize City on “National Heroes and Benefactors Day”, a public holiday in Belize. Last year some 100 teams from Belize, the United States, Canada, Japan, Great Britain and other countries participated. Hundreds of people line the shores in San Ignacio, and along the race route, especially at villages such as Teakettle, More Tomorrow, Bermudian Landing and other rural communities, with exuberant parties and barbecues held during the overnight stops. During the 2012 La Ruta Maya, Great Britain’s Prince Harry, a Chaa Creek guest at the time, christened one of the Belizean eco-resort’s custom built canoes for the British High Commission’s entry during Queen Elizabeth II’s Diamond Jubilee. Chaa Creek owners Mick and Lucy Fleming said the race has always held special significance for the popular Belizean eco-resort. “La Ruta Maya is something we really look forward to each year, and right now some of our staff members are preparing the canoes and training for what is always a very gruelling challenge. In addition to uniting the nation in an exciting sporting event that is uniquely Belizean, the race is invaluable in promoting environmental and cultural awareness. The coverage allows people to see how beautiful our rivers are, and why it’s important to keep them clean and unpolluted. “The rivers are also an important part of Belize’s history and cultural heritage. The Maya Empire flourished for thousands of years along these rivers, with vibrant trade from the highlands of Guatemala all the way to Belize’s Caribbean seacoast, where sea trade routes were protected by the great Mesoamerican Barrier Reef and ran from Mexico down to Panama and perhaps beyond. “And during the colourful ‘Pirates of the Caribbean’ days, buccaneers used the treacherous reef passes to their advantage, and hid their treasures up along the rivers. All along the river there was ample timber for shipbuilding and repairs and plenty of game for hunting and smoking. In fact, the name ‘buccaneer comes from word for smoked meat. And of course, the rivers were the primary means of transport since the early days of European and African settlement, just as they were for us,” Ms Fleming said. “It’s a very carefree and surprisingly affordable way to enjoy a Belize vacation, and during the La Ruta Maya we work with guests to allow them to participate and see as much of the race as they wish. At the end of the first leg of the Ruta Maya, team NICH crossed the line, narrowly edging out Koop Sheet Metal. It was an awesome first day of racing for these hard paddling gentlemen. The turn out was great! The support was great! These racers have will power and courage to take on a challenge this great. 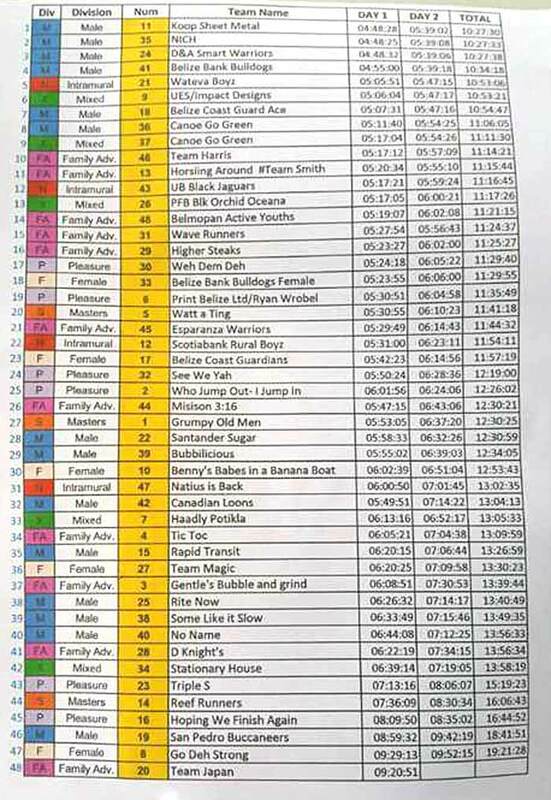 Congratulations to all the participants on the first day of the challenge. J'aerials will be right there to capture your moment of glory! The Official standings for Day 2. There was still one team in the river: Team Japan. Team NICH (National Institute of Culture and History) has won the La Ruta Maya Belize River Challenge 2017. Here is a short video by Will Moreno Photography In the first clip you can clearly see Team D&A Smart Belize Warriors edging out Team NICH to the finish of the 4th and final stage of the race but team NICH had performed well throughout the race that their cumulative time have them winning first place. In the final clip team Higher Steaks - Running W Brand Meats team is comprised of 3 young boys ages 9, 13 and 15 years old and they held their own in the race with the hearts of champions knowing they were competing against adults. They will only get better. Very proud to see their passion, courage and endurance, they are the future of the race. 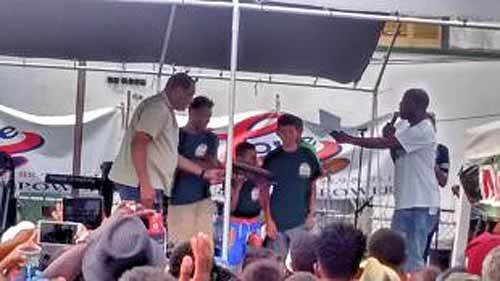 While NICH claimed the first place prize in this year's La Ruta Maya, the biggest winners and the clear fan favorite was team Higher Steaks. The team has captured the attention and earned the affection on Belizeans across the country. The team is comprised of 3 young boys ages 9, 13 and 15 years old. 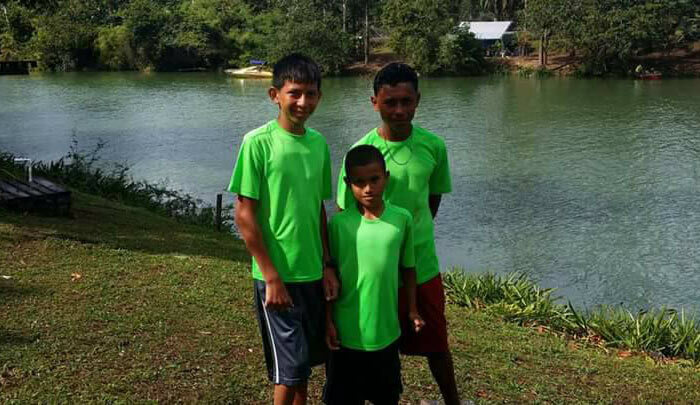 These boys are reportedly from the Cruz family of Esperanza Village who are the most decorated paddlers in the history of the La Ruta Maya challenge. The Higher Steaks youngest paddler, Danny Cruz, is son to Daniel Cruz who has paddled with Belize Bank and now Koop Sheet Metal and has 8 championships in the pro division and his wife Delilah Cobb (now Cruz) who has also won in the female division. The youngest brother, Ervin Cruz has won titles in both pleasure and pro categories. The boys were reportedly rewarded with an impromptu station prize of almost $1000 dollars from CEO of the Social Security Board Colin Young and former Senator/General Manager of Wave Radio Juliet Thimbriel. However it did not end there, social media has been filled with persons expressing how proud they were of the boys and that they too wanted to give them tokens of their appreciation. They may not have captured the top prize but they sure have captured the hearts of many Belizeans. Update: The team one the Perseverance Award which was courtesy NICH and presented by Hon. Patrick Faber Deputy Prime Minister of Belize. The 2017 La Ruta Maya river Challenge ended in Belize City today. The teams made their last stop at the Swing Bridge this morning, and gathered in the Bottom Dollar parking lot on North Front Street for the award ceremony this afternoon. Seven teams emerged with first place prizes, after the 180-mile race, which was broken into four phases. Team NICH (National Institute of Culture and History) took first place in the Male category; Belize Bank Bulldogs won first place in the Female category; Wat Eva Boyz took first prize in the Intramural class; U.E.S Impact Designs was first in the Mixed category; Weh Dem Deh, took first place in the Pleasure category; Team Harris was first in the Family class; and Watt a Ting was first in the Masters category. Team Higher Steaks took the Perseverance Award for being the youngest team in the race. The team comprised of three boys, ages nine, 13 and 15 years. The Forestry Department, Police Department, Oceana and Galen University, were also acknowledged for assistance rendered throughout the race. This year’s installment of the La Ruta Maya River Challenge marks the 20th incarnation of the race. On its inaugural race, the competition had a $1000 prize; however, during this year’s competition, racers received more than $8000 worth of cash and in-kind prizes. Congratulations to Efrain, Felix and Hener Cruz. I would like to say that La Ruta Maya was fun. The strength and endurance that these guys put in was awesome. Also, I would like to say apart from the race it was a fun time hanging out with Jerry Martinez, George E. Thompson, the NICH service crew and staff who came out and just supported the team. NICH is now part of the history books and so are the memories and comradery that we all walked away with. Again, this is only possible with the perseverance and endurance of Efrain, Felix and Hener. Also without the financial support of NICH, this would have not been possible. And last, Ms Diane C. Haylock, this win was for you. We never forgot your support and we truly missed your presence. However, the paddlers, myself and Jerry enjoyed the conversations during the race with you. 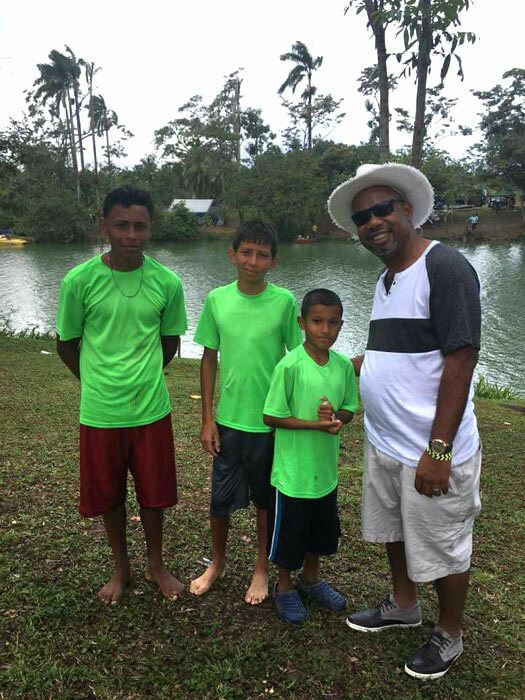 Also, thanks to Mr. Wade Binion who took time from his job and family to come to Belize to build a canoe for NICH. Thanks. Excellent video of the finish of this year's La Ruta Maya. Well done, J'Aerials Photography! "These guys paddled out their hearts.. Depicting the true meaning of courage and will power. 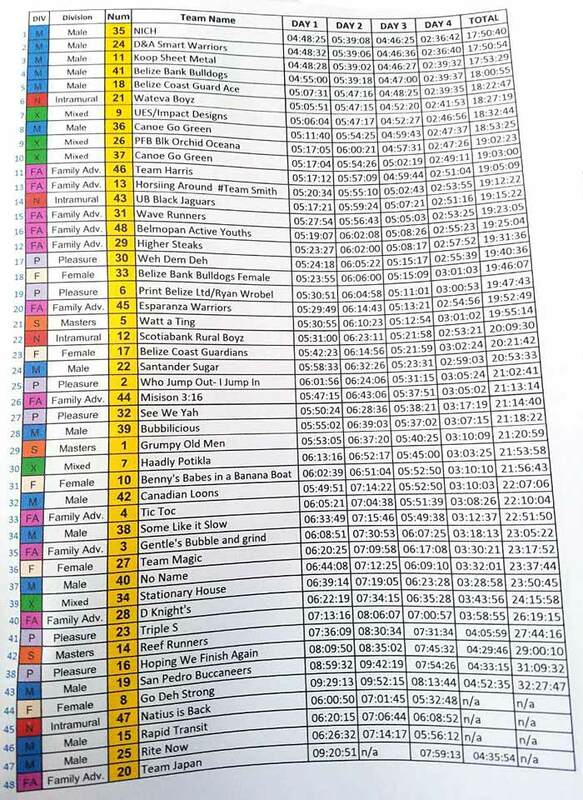 Kudos to all the participants whether they were able to finish or not, you all did a marvelous job. 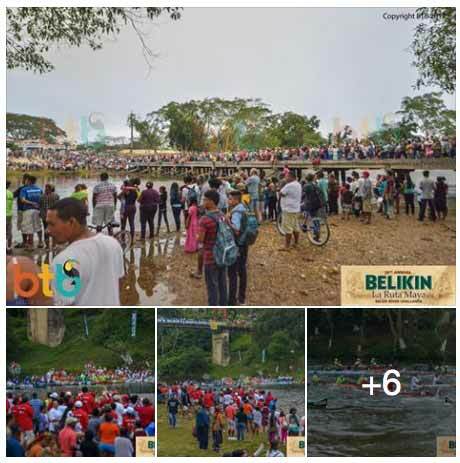 Looking forward to see an even bigger turn out next year and may unity, friendship and good sportsmanship continue to grow throughout the Belikin La Ruta Maya River Challenge!!" 2017 La Ruta Maya Belize River Challenge Day 1 Highlights, 21min.The first days highlights of the 2017 La Ruta Maya Belize River Challenge, from San Ignacio to Banana Bank. Meet many of these paddlers, see and hear their journey down the Belize River. 2017 La Ruta Maya Belize River Challenge Day 3 Highlights, 56min. You wont want to miss this exciting finish, where two side by side canoes tip over just short of the finish line. What happens next simply remarkable. See the action and the interviews with the paddlers as they make their way from Double Head Cabbage to Burrell Boom. 2017 La Ruta Maya Belize River Challenge Day 4 Highlights, 45min. From Burrell Boom to Belize City. Watch the final days interviews and see what happened to the one second lead going into the last day. What an amazing finish at Burrell Boom for these two teams!, 1min. Watch this amazing incident with Wateva Boyz and UES/ Impact Designs at the finish line of day 3, where a paddler managed to remain in his team's partially submerged canoe an continue paddling to get their canoe across the finish line!